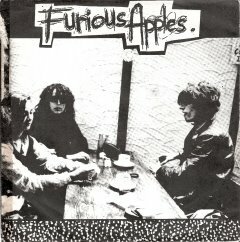 Coventry Indie band ‘Furious Apples’ based around the enigmatic Greg Crabb, mainstay of the Coventry Music Scene in the mid 80’s (he also ran the Pilgrim Club disco). Along with his brother Michael, they were heavy giggers and knew how to promote themselves. Members came and went . Coventry – Spring 1983. 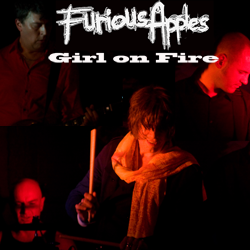 The Furious Apples vocalist Greg Crabb recruited Robin Hill (Pink Umbrellas) on drums, John Westacott (ex-Urge) on bass and Raphael Moore on guitar, along with Mike Crabb, and Abbe Collins on keyboards to record a 7″ vinyl single – Engineering b/w Belladonna, was released in October 1983 recorded at 8 track Cabin Studio in Coventry. This was the second release on the Sonar record label and Paul Sampson engineered and produced both songs. A few copies are still available from the Sonar shop and also from HEAD records in Leamington Priors.